SJ: How did you get started playing music and when/how did the dobro enter into the picture? CS: Thanks Rob! I’ve been around music for as long as I can remember. When I was growing up My mom was a singer in a bluegrass gospel band called the Christainairs and they played all over the West Virginia/Ohio region. So I was fortunate enough to be surrounded by gospel and bluegrass music throughout my childhood. My mom would pull me up on stage to sing when I was 2 years old and I traveled with them until I was a teenager. 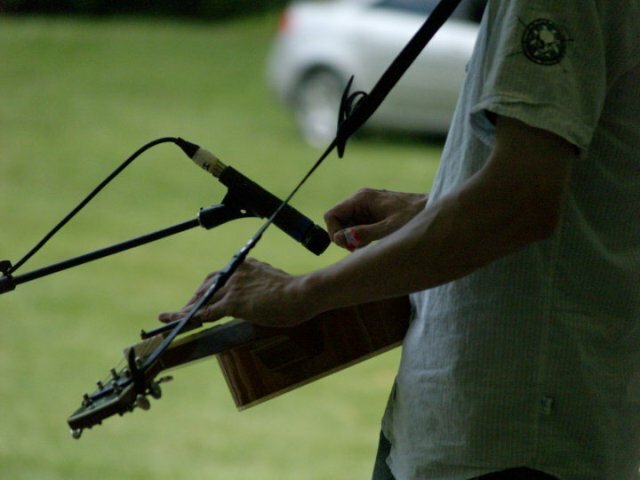 I started playing Drums when i was 12, and played in all sorts of different bands all through high school – mostly rock and country bands, but I always had a love and appreciation for bluegrass and acoustic music. I was in The high school choir and show choir all through high school and attended Potomac State College In Keyser, West Virginia. I majored in vocal performance and music education.I was there for a year and decided that i wanted to put college on hold and move to Morgantown, West Virginia to check out the music scene there. I was still drumming at the time and was listening to a lot of jazz and bluegrass. I had always a big fan of Jerry Douglas wanted to buy a Dobro to see if i could teach myself to play it. So I went out and bought a Johnson D60 model Dobro to learn on. That was around 2002. SJ: I really admire that you have managed to become a good player in a few short years. Can you share any insights into your practice routine or any learning techniques? CS: Well thanks for the compliment! I practice at least an hour everyday, sometimes longer. I also like to practice with cd’s!. 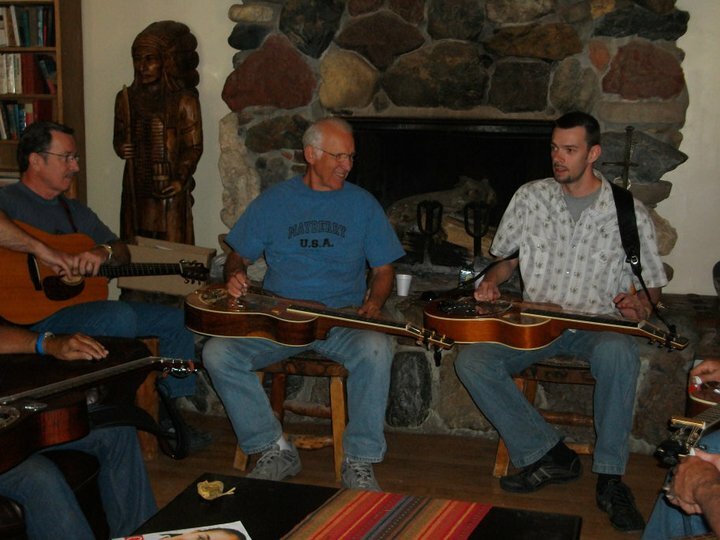 When I started out I would play along to CD’s with other Dobro players to pick up licks and work on my timing with rolls and improve my technique for better tone and just to pick up new ideas. Lately I’ve been listening to a lot of guitar players – acoustic and electric – as well as horn players. IMO finding the melody is a key when playing Dobro! I bought both of Rob Ickes’s instructional video’s and learned a lot from both of them! Rob is great teacher as well as an awesome player! SJ: Without knowing any better I’m inclined to think that the Dobro is more prevalent in West Virginia than where I live in Chicago. So…what’s the local music scene like where you live? What kinds of gigs are available in your area? CS: Great question! You would think there would be a lot of Dobro players In West Virginia, but there are only a handful of people who I know of that play. Bluegrass is very popular here and there are quite a few places that feature live bluegrass music. We have a few different Opry houses here that have live bluegrass on the weekends and some of the local pub’s feature live bluegrass during the week. SJ: Tell us about the bands and musicians you play with: do you consider yourself primarily a bluegrass dobro player? Are you open to playing in a variety of musical settings, etc? CS: At the moment I’m not really playing full time with a band. I’m in a side band called Rush Hour. It’s more of a progressive style of bluegrass; kind of like a New Grass Revival type of band. 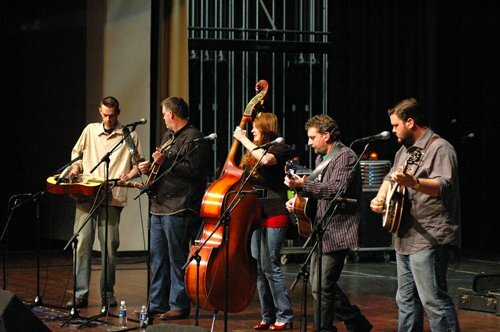 We have won 7 major band contests and we showcased At IBMA in 2004. I had a short stint with Lou Reid and Carolina and the first band I played with when I started playing Dobro was with John Douglas and Acoustic Heritage. John is Jerry Douglas dad and Jerry’s brother Blaine Douglas was the bass player in that band. Needless to say I had to make myself a better player quick! (laughs). I have been involved with several other bands – The 3rd String band, Shavers Crossing, Buck Carroll and Breaking new Ground – all from the West Virginia /Kentucky region. 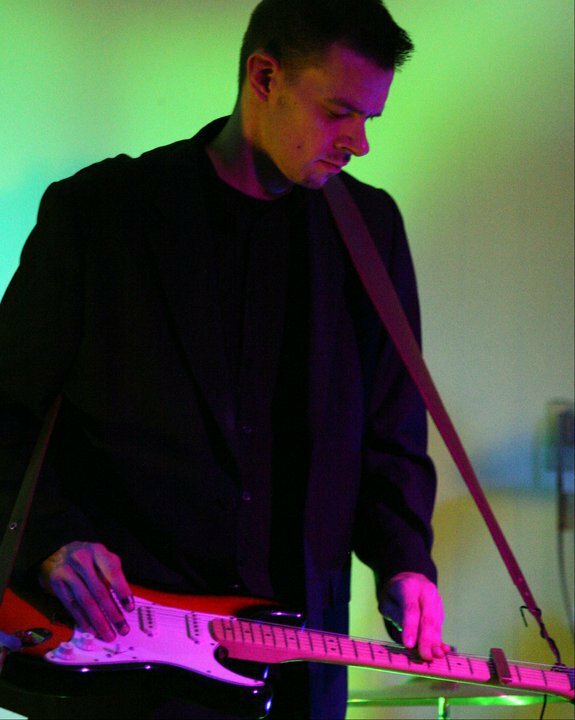 Recently I have been playing some shows with 4 Fret Chord – which is a great band based out of Gatlinburg,TN. I also play with Chet Lowther a great Singer/Songwriter from Washington D.C.from time to time. I don’t consider myself primarily a bluegrass player. Don’t get me wrong – I love to play bluegrass music! It’s one of my first loves, but I also love to play the blues, as well as country music and I’ve been working on a lot on jazz standards. I’m a big Miles Davis fan and its really fun to work out his solos, especially his early stuff on the Dobro. I love John Scofield and Bill Frisell as well and I would love to play in that kind of setting one day! SJ: When I listen to your playing you seem to have mastered the art of playing melodies with rhythmic drive. Can you give us any insights into your right hand technique and tone production. Do you utilize the so-called “ping pong” ball right hand position? Can you share any general comments on playing with good timing and good tone? CS: I try to keep my right hand stationary near the palm rest when I’m playing rolls. That’s where the best tone comes through for me. I do use the ping pong hand position. Playing fast bluegrass is challenging and good technique helps me play at the speed I need for rolls and fast hammer on’s and pull off’s. Playing a little harder when doing pull-off’s helps me to play with better tone and not putting too much pressure on the bar,not pushing down on the strings will help your tone as well.for timing I say practice with a metronome.I might be bias to this, since I played drums for so long.but I think it will definitely help your timing out. SJ: You may have heard me say this before; but I have a strong belief that musical friendships and playing music with “real” people – is an essential part of anyone’s development as a musician. Along those lines, are there any musicians in particular that have had a significant impact on your own development as a musician? CS: I agree 100% that playing with people will help develop you into a better musician! My friend Duane Simpson has made a big impact on my playing and growing as a musician. We both grew up playing in bands together and he was my roommate when I moved to Morgantown, West Virginia. We played music all the time. He is a jazz/blues/classical guitar player and now lives in Asheville, North Carolina. Duane is a wonderful musician, dear friend and a great influence on my playing. SJ: Let’s talk about the creative side of musicianship for a moment: Any comments about your approach to creativity and/or improvisation on the dobro? Do you write your own tunes? CS: I try not to rip off other Dobro players. Its hard to not to do that because the instrument is so young. It’s very easy to pick up licks from other players. I try to listen and pick up influence from singers and other musicians, not just Dobro players. I really try to play what I feel. I write my own material and I’m trying to put together a solo cd to be released in the spring. I’ve recorded a few songs and I have a bunch of idea’s that i can’t wait to layout and see what happens with them. SJ: Tell us about your gear: what kind of guitars do you play? Also, what does your live performance rig consist of? CS: At the moment i’m playing a 2002 Gibson Hounddog F60,That I had Paul beard and his fine crew of luthiers set up for me and add a few baffles. I’m very happy with it!. It reminds of a late 70’s/Early 80’s R.Q Jones. I have played many of these Gibson models.and none of them compared to this one. I ‘m looking right now at the Meredith’s and thinking of ordering one of them! Tooter is making one fine instrument right now. I’d also love to have a Scheerhorn! They are just awesome! On stage i use a SM 57 Mic .It gives me the cut and tone I need on stage.they are great mics!. SJ: What are your plans for the future? Do you have any closing words for our readers? CS: Right now I’m looking to play as much as I can and continue to work on my technique and becoming a better dobro player! I have a few recording projects coming up that I’m looking forward to. I hope one day I can join a serious band and travel the world and play music or become a session player. My advice for the readers is play as much as you can. Practice, practice, practice – and play with as many people as possible. It can only make you better!